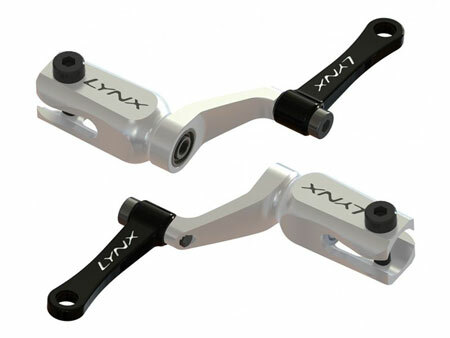 Lynx Heli Innovations has redesigned the 130X Main Grip Thrusted introducing Direct Flight Control System (DFC). Thanks a unique, innovative and simple design, we created the ultimate DFC Main grip thrusted for your 130X. We spent time optimizing the design and fly testing to achieve the best fly control and superior resistance in case of crash. Special rigid and not adjustable plastic rods connect swash plate and main grips directly; the same rod assures a precise anti-rotation function. Thanks those combined DFC rod functions fly input as the FBL unit correction move will be transmit much quickly, without any delay to main grip / main blade increasing fly precision for the ultimate 3D fly. Our 130X DFC Main grip thrusted is based on lightweight, simplicity and efficiently to achieve the best fly enjoyment with the less number of parts. They must be used with DFC upgraded head/hub. - Super precise on fly and super strong in case of crash.